Recycling is an excellent way of saving energy and conserving the environment. Creetown’s “Reuse Matters” project exists to responsibly collect and divert waste from landfill, while promoting the concept of zero waste. Our mission is to offer upcycled alternatives to traditional fashion and home goods as a way to reduce landfill waste. We aim to educate people on the benefits of upcycling, so when given the choice, they select an upcycled product over a new one. The Reuse Matters project aims to reduce the amount of waste sent to landfill by encouraging residents to donate clothing and household textiles, which would have otherwise been thrown away or remain unused forever in wardrobes and drawers. Items that are no longer needed or wanted will be given a new lease of life by being transformed into something that is either useful or creative. A pair of jeans turned into a shoulder bag or soft toys, old ties into a dress… the possibilities of upcycling are endless! When you upcycle an item, you aren’t breaking down the materials. You may be refashioning it, like cutting a t-shirt into strips of yarn or converting it into a designer bag, but it’s still made of the same materials as when you started. Also, the upcycled item is typically better or the same quality as the original. To encourage people to upcycle and reuse, Reuse Matters offers a free collection service (using our community car club electric vehicle). The Reuse Matters project is looking to bring together a wide range of local individuals and groups with the common aim of promoting and supporting the reuse and upcycling of clothing and textiles. 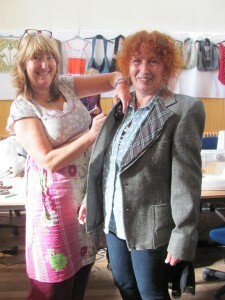 Awareness raising events including open days, clothe swap events, talks and sewing workshops for people of all ages and abilities are being held in Creetown and across the Mid Galloway project area to teach about the benefits of upcycling and the sort of things that can be upcycled into something new and useful. If you are familiar with sewing but don’t have the space or equipment, you are more than welcome to simply pop along and use our sewing machines, embroidery machines, overlockers, material etc if you would like as well. Reuse Matters hopes to encourage people to view this community initiative as their “reuse community project”, which will help both the community and the environment. We want to educate people to create and maintain a “think before you throw” ideology. The workshop premises have been fitted out with furniture and equipment to enable sewing workshops and demonstrations by textile artists to take place, or for use by members of the community. A number of local and national textile artists and craft workers have been contacted with regards to future cooperation, and specialised workshop dates have been booked for the future. These will be free for anyone to attend. 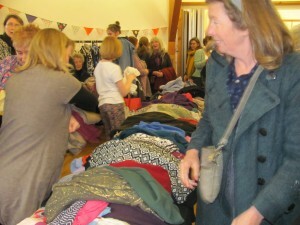 Following on from the success of the first clothes swap held in Kirkudbright, similar events are planned to take place throughout the region. Thanks to the generosity of a manufacturing business we have a large quantity of polyurethane latex (PUL) material, both patterned and plain that is available for FREE to any craft person or group to collect. As a waterproof material it would be deal for a large number of uses, travel rugs, pet beds, seat covers, play tents and mats etc. 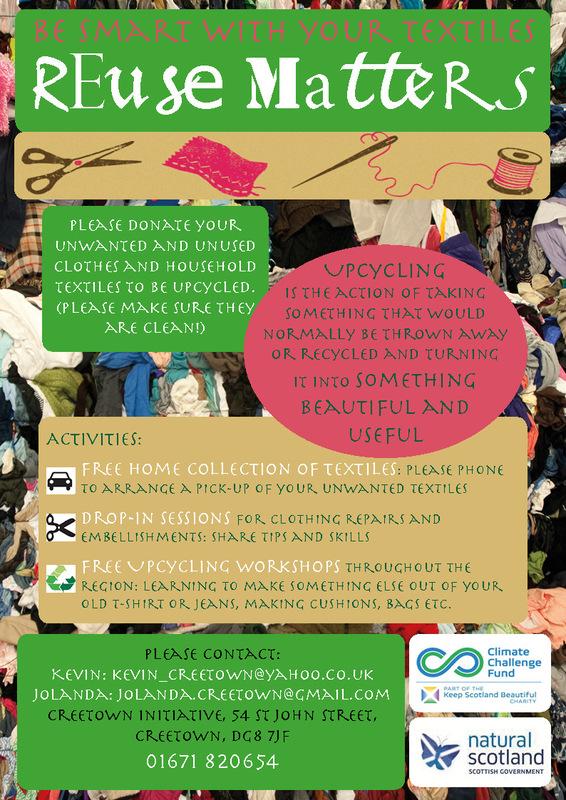 Check us out on facebook @Reuse Matters Creetown, or pop into the Creetown Initiative office to keep up to date with all the FREE workshops that are planned. We are very conscious of the many people who already recycle and donate goods to charity shops, schools, groups or textile collection points and applaud their actions.